Formerly referred to as Barytine, Barite is a mineral composed of barium sulfate (IUPAC nomenclature “Barium tetraoxide sulphate”) belonging to the Celestine group, along with other sulphate minerals. It is one of the heaviest non-metal minerals in nature, and for this reason has many uses in a broad range of fields. It originates through the deposit process of hydrothermal solutions, especially at high temperatures; it can then go on to form monomineral veins, be waste material (in the form of sand, gravel, etc.) be extracted from metal deposits or (more rarely) be found in sedimentary deposits. This versatility in terms of extraction has its pros and cons: barite is commonly found in various quarries, but its quality and purity is highly variable, as is the amount that can be extracted from the individual deposits. The special properties of Barite have been well known since the ancient Greeks, in fact the name itself comes from the Greek word “barys” = heavy. they started applying a very thin layer of barite powder as a base on photographic paper, to brighten it. Over the years the chemical industry has made use of this mineral’s properties to produce white pigment for coatings, paints, powder coatings, washable water paint, rust-agents, plastic materials, rubber, glues, stickers, stuccoes, putties and clutches. Today approximately 75/80% of world barite extraction is used in the petroleum industry, as its pure powder (combined with bentonite) forms sludge used in drilling. The barite content in the sludge makes it heavy, balancing the pressure in the deposit and controlling extraction. As one can imagine, this type of use means that the price of the pure mineral varies depending on the petroleum market. Watercraft (submarines and ships) and cable cars ballast tanks are another application of barite that exploits its high specific weight and the complete absence of metal traces in its crystal. 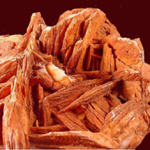 In its vast range of applications, barite is also a collectible mineral. 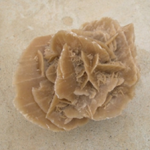 In fact, if it is well-crystallised, it can develop into veritable natural master pieces such as Desert Roses. 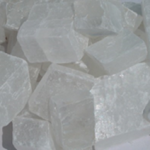 Secondary uses of barite play a part in the glass barium salt production), pharmaceutical, and, as in our case, construction industries. To produce barite concrete, the mineral does not require any particular colour or purity; nonetheless, any secondary characteristics, such as hardness and specific weight, make packaging the conglomerate very complex due to the high tendency of the mineral to crumble.